Hardened police detective John Kimble (Arnold Schwarzenegger) sets up an undercover operation to track down the runaway girlfriend of drug lord Cullen Crisp (Richard Tyson), after she absconded with three million dollars of his drug money. A first-day mishap has Kimble stuck masquerading as a kindergarten teacher, and he is soon completely out of his depth. 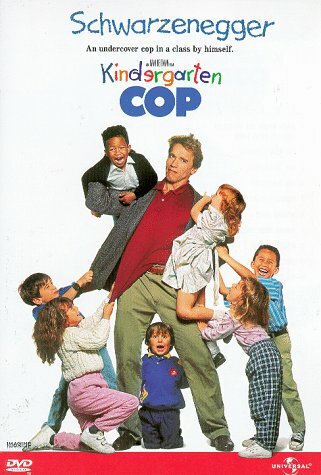 We never really talk about Kindergarten Cop. It was a commercial smash hit back in 1990, and further emphasised Arnold Schwarzenegger’s second career stream as a comedic performer. It is also precisely the sort of film that nobody ever writes about. Why would they? It’s a disposable family comedy, designed to be consumed and forgotten after making a tidy profit for Universal Pictures. Even in director Ivan Reitman’s own career it tends to be overlooked in favour of higher-profile hits like Ghostbusters and Twins. In most respects it is about as generic and ordinary as a late 20th century Hollywood comedy can be, and yet I keep coming back to it every few years. It has a weird kind of a gravity to it. I think a lot of that comes down to how well the film picks a high concept comedic premise (Schwarzenegger teaching kindergarten!) and not only commits to it, but finds genuine warmth in the concept. The screenplay, credited to Murray Salem, Herschel Weingrod, and Timothy Harris, smartly finds unobtrusive corners to drop in small moments of character and resonance. Kimble is divorced with a child he never sees, and he clearly regrets that. His undercover position ultimately acts as a kind of healing: it makes him realise he is not happy in his job and offers an escape into something else. It all adds a little wrinkle to the otherwise fairly silly premise of a tough narcotics cop pretending to teach five-year-olds. The film also has a surprisingly dark edge to it, via the visible trauma that has been inflicted on Dominic (twins Christian and Joseph Cousins) – snatched away by his mother Joyce (Penelope Ann Miller) as a toddler and living in quiet fear of the ‘bad people’ returning to steal him back. That dark side is particularly evident in a subplot about child abuse. The treatment is somewhat superficial, but it is commendable that it is featured at all. At this stage of his career Schwarzenegger had presence but not a huge amount of talent. Reitman wisely surrounds him with stronger performers – not just Penelope Ann Miller as love interest and local teacher Joyce, but also the very talented Pamela Reed and Linda Hunt. As Kimble’s detective partner Phoebe O’Hara, Reed is a comic gem throughout – and her eccentricities are presented in such a way as to never demean or ridicule the character. When the film hits its climax, she is presented as an effective and highly competent police officer. As the school principal Miss Schlowski, Linda Hunt does not have a huge amount to do other than be stern and disapproving, but she is honestly such an entertaining actor that she lifts the film’s quality just by entering a room. The usual Hollywood caveats apply: the film is ultimately more comfort food than provocative entertainment, the end result is never in doubt, and Randy Edelman’s overly jaunty score simply will not stop playing. All that in mind, and when you’re looking for a simple and uncomplicated fun movie, Kindergarten Cop just keeps working year in, year out. Hollywood may be a machine, but this particular confection has been very well manufactured by it.